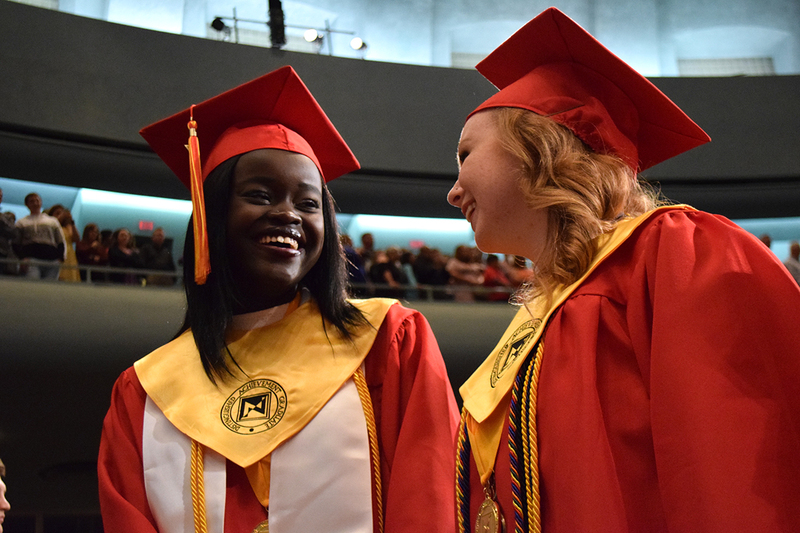 Seniors Emma Evans and Taylor Smith laugh at each other as before taking their seats for commencement, which was held at the Community of Christ Auditorium on May 11. Seniors participated in their graduation ceremony held at the Community of Christ Auditorium on May 11. The choir and the symphonic band performed in memoriam of those who had served in the military for the incoming Memorial day. The Cardinal and Gold Singers and choir seniors sang “Stand in The Light.” Chosen seniors gave speeches regarding the 2017 senior class and the senior class gift was presented. Senior class president Emma Evans welcomes the audience and thanks those who had helped and supported the seniors on their journey through high school, while describing the accomplishments of the senior class. Senior class treasurer Micah Brown-Davis announces the senior class gift, a mural between E and F hallways. Principal Mark Maus accepts the gift as part of the graduation ceremony. The choir and symphonic band perform “Battle Hymn of the Republic” for the incoming memorial day, in honor of those who had served in the military. Senior Esmeralda Deleon speaks of her personal experiences going through high school and talks about the reality of high school, but also the strong relationships formed that persevered through the challenges and will continue to live on in their future lives. Seniors Cayla Adamson, Lilian Juma and Charity Smith share their poem about how the seniors have survived through challenges and thrived in accomplishments in a wide variety of ways. Choir seniors Jake Skinner, Maddie Fields, Kiara DeVine and Derrek Lewis lead the singing of the Alma Mater on stage at graduation. They auditioned to be able to lead the Alma Mater.